The following article contains an eyewitness description of the bloody fighting near the village of Perryville in Boyle County, Kentucky during the second year of the American Civil War. This account is from an undated letter written about 10 days after the fighting by Major George T. Simonson, the then third-in-command of the 80th Indiana Volunteer Infantry Regiment. At the time of the fighting the 80th was one of the regiments in the 34th Brigade commanded by Col. George P. Webster [who was killed during the battle], in the 10th Div. commanded by Brig. Gen. James Jackson [who was killed during the battle], in the 1st Corps commanded by Maj. Gen. Alexander McDowell McCook, in the US Army of the Ohio commanded by Maj. Gen. Don Carlos Buell [who was removed from command after the battle]. Abbreviations used on this page include: Brig.=Brigidier; Capt.=Captain; Co.=Company; Col.=Colonel; Div.=Division; Feb.=February; Gen.=General; Ind.=Indiana; inst.=instance; Jun.=June; Lieut.=Lieutenant; Maj.=Major; Mar.=March; Oct.=October; U.S.=United States; '62=1862; and '63=1863. Source: Princeton Clarion newspaper, Princeton, Gibson Cty., Ind., Oct. 25, '62. Courtesy of Sam I. Chesnut, Great Grandson of Pvt. Thomas J. Chesnut Co. A, 80th Ind., who was wounded in action there, and is named in the article. Note: Information has been added [within brackets] to correct or clarify details in the article. The 80th Indiana Regiment has covered itself all over with glory at the Battle of Perryville. It stood up like old disciplined soldiers though not two months old. For the purpose of giving a little information to all, I write you a very hasty account of the battle of the 8th inst. The cannonading began early in the morning. The general engagement of infantry commenced fifteen minutes before 2:00 p.m. and closed about one hour before dark. 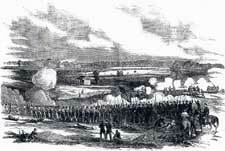 The position of the 80th was about the center of the line of battle, just to the left, and supporting Harris' Battery. The rebels under Bragg [Confederate Maj. Gen. Braxton Bragg] advanced directly in our front for the purpose of [capturing] Harris' Battery, which annoyed them very much [with its shelling]. This column of rebels was in our uniform and carrying stars and stripes. This I saw having been requested by General [sic] Webster. I rode out in front of our lines 200 yards, which was in the woods, and saw this column moving on our regiment which was lying at the crest of a bald hill. They opened fire on me and Capt. Lewis' Company [Capt. William D. Lewis commanding Co. I of the 80th], which at the time was deployed as skirmishers, killed two of his men in this fire. I rode up to General Webster and reported facts. By this time the rebel devils had filed into line in our front and taken their respective tree to fight behind. We were ordered to fire and did so firing 60 rounds while holding position. At this time the firing became general and we were for an hour and a half under three separate fires from the enemy -- one column firing on our right oblique, another left oblique, and another direct in front. We drove them from our front, when they changed position right and left, when we were ordered to change position and receive them on the right of Harris' Battery. As they came through a corn field they were in plain view and we literally mowed them down. The fighting was said by old soldiers and Generals to be terrific, and the hardest contested battle they ever saw -- this was said by both Donelson and Shiloh heroes [men who had been at the battles of Fort Donelson and Shiloh, Tenn.]. Bragg retreated at once towards Harodsburg [Harrodsburg in Mercer Cty., Ky.] and Danville [in Boyle Cty., Ky.], leaving unburied his dead, and our surgeons are taking care of many of his wounded while his surgeons have their hospitals in our lines. In our regiment we lost: killed 24, wounded 117, missing 33. Having engaged 450 men, our casualties are grevious [sic] indeed. While engaged the Col. [Lieut. Col. Lewis Brooks commanding the 80th] sent Sergt. Maj. Slack [believed to be Edward W. Slack] on my horse for more ammunition and he, with the horse, was captured. I am left afoot and am nearly naked -- all I had being on my saddle except my trunk which was left at Louisville. Adjutant Owen [1st Lieut. Alfred Dale Owen F&S] is among the missing. We know Slack was captured because they had Asst. Surgeon Culbertson [Robert H. Culbertson F&S] and released him, holding Slack still a prisoner; also Joseph Small [Pvt. Joseph Small Co. A], and Steven Stewart [Pvt. Stephen T. Stewart Co. A], with an ambulance which they had on the field and got over in the rebel lines, were captured. This was just at the close of the battle. I would like to give you a detailed account and description of the battle and battlefield, but the only opportunity we may have for some time to write is now, and I am hurried to close. I will write again when opportunity offers. P.S. I forgot the mention that I can compliment all of the 80th and particularize no one for they behaved with great coolness and bravery, taking ammunition from dead and wounded companions to keep up their supplies. Co. A KILLED: Sergt. E.D. Glick [Erasmus P. Glick], Corporals A. Parmenter [Aden Parmenter], J.W. Wilson [John W. Wilson], and J.C. Triplet [Frederick C. Triplett]. WOUNDED: Privates W.C. Lamb [Whitman C. Lamb], hip [survived]; J.S. Wallace [Samuel J. Wallace], hand [survived and returned to 80th]; E.W. Givens [Edward W. Givens], side and arm [survived, but discharged from the army Mar. 23, '63 due to his wounds]; S.C. Polk [Silas C. Polk], head [survived and returned to 80th]; T. Chestnut [Thomas J. Chesnut], arm and foot [survived, but discharged from the army Mar. 15, '63 due to his wounds]; W.H. McCracken [William H. McCracken], leg [survived, but discharged from the army Jun. 29, '63 due to his wounds]; J. Marlet [John Marlet or Joseph Marlet], head [survived and returned to 80th]; J.H. Ashmead [John H. Ashmead], both legs [survived and returned to 80th]; J. Carithers [James Carithers], head [survived, but discharged from the army Feb. 5, '63 due to his wounds]; E. Kimball [Elisha Kimball], mortally [died of his wounds Oct. 18, '62 at Perryville]; E.P. Estes [Zebulon P. Estes], seriously [survived, but discharged from the army due to his wounds]."